Jared Diamond's books have become phenomenal bestsellers. Both Guns, Germs and Steel and the more recent Collapse have sold in their thousands and are regularly referenced, quoted and used as academic texts. Diamond has been, and should be praised for his attempts to look at human society and history with a critical eye. Famously he quotes a Papua New Guinean, Yali, in the first book, who questions why it is that white people have all the goods and his people have none. In trying to answer this complex question, Diamond challenges many assumptions. Not least some attitudes of racial superiority from the whites against those with darker skins. However, many people clearly feel that Diamonds reductionism is inadequate. I felt that Collapse was less persuasive than Guns, Germs and Steel. In my review of it though, I complained that I didn't like the way that Diamond could point the finger at irrational behaviour in historical societies, without a similar critique of the irrationality at the heart of modern capitalism. In Questioning Collapse, a wide range of anthropologists, archaeologists and social scientists offer their responses to Diamonds books. Most of these responses are very critical indeed. The advertising campaign for Collapse centred on Diamond's version of the story of the end of the civilisation on Easter Island. Diamond located the collapse here, in the irrational destruction of the islands forests. "What did the person who cut the last tree down think?" was the question posed by the advertising agency. Yet the title to the chapter on Easter Island in this volume refers to the "Myth" of ecocide on Easter Island. The authors conclude that "there is no evidence that the island represents a case of 'ecocide' where a large population crashed from environmental ruin before Europeans arrived". Instead, this version of the Easter Island story is one were the European arrival was the trigger for population crash on the islands, instead, "as the idea of 'ecocide' has gained currency, the victims of cultural and physical extermination have been turned into the perpetrators of their own demise!" Similar arguments are thrown up in other chapters. The author of the chapter responding to Diamond's thoughts on the "Archaeology of the American Southwest" is very critical of Diamond's methods. He accuses Diamond of "completely ignoring" thousands of years of history. The story of "environmental mismanagement" by indigenous people that Diamond offers, this author suggests, ends up justifying the actions of the colonizers. After all, if the native people couldn't manage the land properly, than those who came after them could. Thus, despite the evidence of thousands of years of successful farming in the desert, we are led to believe that the indigenous people were "failures" whereas those who green the desert of the American south-west with golf courses are somehow successful. Several essays remind us that many of the civilisations that Diamond classes as failures, have survived far longer than those that he considers successes. The decline of the Norse society in Greenland, long enough to provide "four additional generations" is, longer than several twentieth-century European states have lasted. The city of Uruk in Mesopotamia, "flourished, though not without its ups and downs, for more than 3,000 years", hardly an example of a mismanaged environment. What these authors are trying to do, is to avoid looking for simple answers to difficult questions. Several of them ask, what do we actually mean by collapse? In Mesopotamia, or South America in the case of the Maya, civilisations declined, and populations decreased enormously. But this does not necessarily mean the end of civilisation. Hundreds of thousands of people still speak Maya, and even play a version of the ancient ball-game. Is this actually a Collapse? Changes to human societies, and even their collapse is down to many factors. Sometimes environmental questions play a role. Though more often, the determining factor is not the climate, but the political and economic setup. The "choices" a society can make are constrained by the social forces within those societies. Some Maya cities did decline rapidly in the face of drought. Others continued to thrive or expand, despite suffering from similar environmental problems. Those that survived were ones that adapted and changed, often because new forces were able to force rulers to behave differently, or stand aside. As in the case of the American people in the south-west, Diamond's failure to explain their own history, ends up misunderstanding the nature of the decline of their society. It ends up letting those who re-shaped America in their own interests, off the hook. Consistently Diamond is accused of misrepresenting the realities of the societies he examines, in the case of south America David Cahill argues, for instance, that he "misrepresents, perhaps unintentionally, the complexity and achievements of Incan or Andean civilization". These essays are stimulating and informative. They are also unusual in that the authors are presented not simply as academics, but as people engaged in real dialogues and discussions with the people and places that they study. Several, such as Michael Wilcox who wrote the chapter on the indigenous people of the south-west of America, are also part of the communities they study. His chapter is both an academic critique of Diamond's work and a personal cry of rage at the attitudes that many academics have taken towards his people. This is not to say the essays are perfect. I was struck reading the book that rarely are Diamond's ideas laid open. It would be more useful if some of the authors had said "on page X, Diamond argues this, but we believe this other thing". Too many of the responses are generalised critiques of Diamond's positions, not detailed challenges to his ideas. These are not academic spats. There are real questions of how groups of humans can and do survive environmental catastrophe. These have important lessons for our own times. As the authors of the chapter on Easter Island finish, the "real story here is one of human ingenuity and success that lasted more than 500 years on one of the world's most remote human outposts." I would recommend this book to those interested in the fates of human societies facing environmental and social changes. But I would also encourage people to read Jared Diamond's books alongside them, at least for reference. Diamond builds up a powerful case and we can all learn from the challenges to his arguments and ideas. 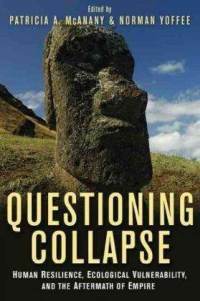 This review of Questioning Collapse by a anthropology academic is also useful and can mark the start point for interested readers who want to reader more about the debates that have sprung up as a result of the publication of QC.